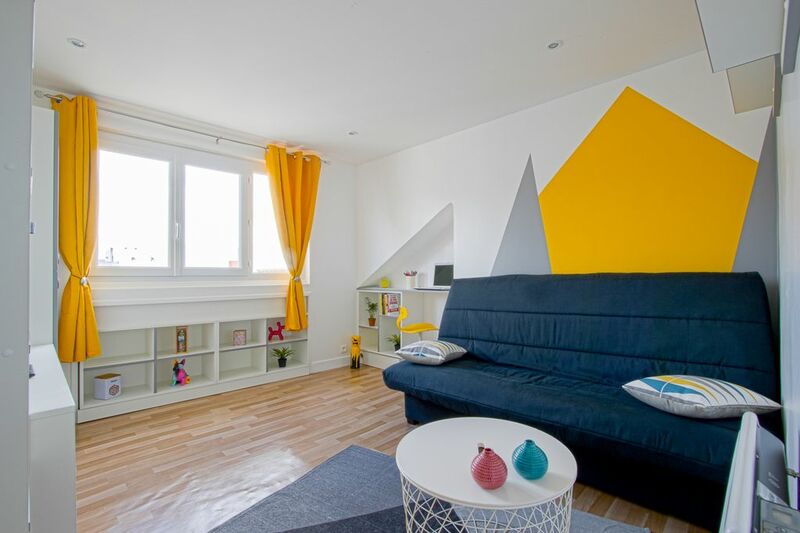 Fully equipped apartment in downtown Le Havre, close to everything! Ideally located for visiting the city or for your business trips, in a quiet and secure building on the 4th floor. 200m from tram A and B "university station". - 5 tram stops from the beach. Very nice and functional accommodation in a very quiet building. Designed to optimize space with custom-made furniture. The apartment is bathed in light. You will not feel cramped in this F1 that has a real kitchen separate from the living space, with the necessary equipment to prepare meals on site (refrigerator, freezer, microwave, toaster, kettle, pod coffee machine, induction hob). The bedding is very good (possibility to equip the baby housing on request). Everyone has an opinion on Le Havre but few people really know it! Because it is an extraordinary city, an exciting city that is tamed, and those who are just passing in a gust of wind are likely to miss a beautiful meeting with a city full of energy and surprise. Destroyed in 1944 at 85%, it was rebuilt by the architect Auguste Perret. In 2005, UNESCO classifies the city as World Heritage of Humanity as a remarkable example of architecture. You will stay in the Sainte-Marie district spared by bombing, it is called "the old center". It is lively, commercial and cosmopolitan. He proposes a facet of Le Havre to discover. Shower gel, shampoo, shower linens and toilet paper are provided. Apartment renovated in modern and refined style. It is equipped with a small dressing room with wardrobe. It has a desk area to install a laptop. Incredible stay in Havre, beautiful appartment for 2 people with great views. The appartment was perfect, It has a lot of information of the things you can do in Le Havre, the homeowner was really friendly and helpful. -Hôtel Dubocage Bléville: 1 rue Jerome Bellarmato.